High Strangeness: Welcome, UFO People! "The Collegian," the newspaper of Hillsdale College in Hillsdale, MI, has a great article today commemorating the 49th anniversary of the "Dexter-Hillsdale" UFO sightings, which is to this day one of the most significant events in UFO history. Although largely remembered today for introducing the term "swamp gas" into the official lexicon of the UFO phenomenon, the D-H sightings were also noteworthy for causing the American public to lose all confidence in the Air Force's handling of the UFO phenomenon, for triggering the first Congressional hearing on UFOs, and for launching the famous University of Colorado Project, better known as "The Condon Committee," which led to the ultimate dismantling of "Project Blue Book," the Air Force's 20-year investigation of UFO reports, by which the government hoped to drive a wooden stake through the heart of the UFO phenomenon once and for all... Oh, and it also made Dr. J. Allen Hynek's name a household term. 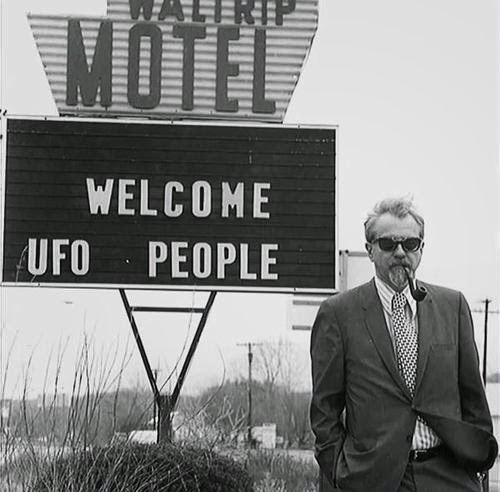 Here's something you don't see every day: J. Allen Hynek being welcomed to southern Michigan. "So Dr. Allen J. Hynek, consultant to Project Blue Book and professor at North­western University, came to Hillsdale to inves­tigate. But after inter­viewing many key eyewit­nesses, including Evans, Hess, and Van Horn, he reached a simple conclusion: 87 eyewit­nesses were mistaken, and had seen only 'swamp gas.'" But that's not the conclusion Hynek reached at all. The truth is, Hynek never actually reached a conclusion. Pressured by his boss on Project Blue Book, Major Hector Quintanilla, to hold a hurried press conference and provide a "natural" explanation for the sightings, Hynek suggested that the lights that the Hillsdale students saw bobbing up and down in the college arboretum may have been swamp gas. There were a lot of witnesses, and a lot of descriptions -- hell, half of southeast Michigan saw something in the skies that week -- but the descriptions varied so dramatically that Hynek only considered those that had common factors and dispensed with the outliers. Unfortunately for the true believers, the descriptions that had common factors all suggested the possibility of swamp gas (the witnesses were, after all, looking out over a densely-foliated arboretum in early spring shortly after an intense thunderstorm had saturated the ground, leading to somewhat, oh... let's say "swampy" conditions) so, with no time to conduct a thorough investigation, that's what Hynek went with. It wasn't a lie. It wasn't a cover-up. It wasn't a mistake. It wasn't a cowardly cop-out. It was the only logical speculation Hynek could make from the inconsistent testimony and scant evidence with which he was presented, and he presented it as just that: speculation. What's more, one of the key witnesses, local undertaker and Civil Defense Director Bud Van Horn, told Hynek that when he saw the lights in the college arboretum he immediately thought they were swamp gas... Van Horn -- who went on to become one of Hynek's harshest critics -- was one of a half-dozen people who suggested the swamp gas theory to Hynek in the days leading up to the fateful press conference, yet no one ever assails their credibility or accuses them of taking part in a government cover-up. So, I'm not sure where this cop is coming from, but I'm damn sure going to find out. Oh, and that comment about how the arboretum was found to be radioactive after the event? Those "findings" came from the investigation of noted local undertaker and nuclear expert Bud Van Horn. They were never verified by anyone. Anyway, Happy Anniversary, swamp gas! Love the photo. It's gotta be a classic.